Home News Local News Grapeland Golf Strikes Gold in Austin! Grapeland Golf Strikes Gold in Austin! 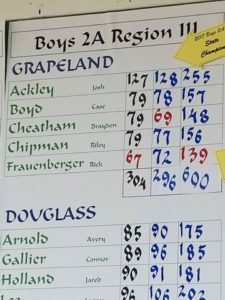 AUSTIN – After finishing as the runners-up in 2016, the Grapeland Sandie golf team was on a mission in 2017. On Tuesday afternoon, May 23 the Sandies completed their mission and captured the Class 2A State Championship in golf. The Sandies shot a two day total of 600 which was 53 strokes better than the second place finisher, the Hamlin Pied Pipers and 71 shots better than the Vega Longhorns who finished third. On the first day of action in the two day tournament, the Grapeland team of Josh Ackley, Case Boyd, Brayden Cheatham, Riley Chipman and Rick Frauenberger shot a combined 304 to open up a 24 shot lead over the Pied Pipers of Hamlin and a 36 shot lead over the Douglass Indians. 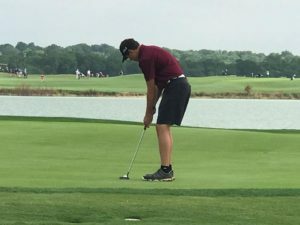 The state championship was held at the par 71 Roy Kizer Golf Course in southeast Austin and on the first day, Frauenberger managed to tame the course with a four under par 67. Frauenberger’s 67 put him five strokes clear of second place and nine strokes clear of third. The trio of Case Boyd, Brayden Cheatham and Riley Chipman all carded a 79 in the first round and were tied for ninth with four other players while Josh Ackley carded a 127. As the second round got underway, Cheatham was on fire and shot a 34 on the front nine. Chipman and Frauenberger both had a 37 on the outward holes while Boyd carded a very respectable 41. As the Sandies made the turn, given the way they had played the front nine, it was hard not to keep an eye on the scoreboard as they inched ever closer to the gold. Cheatham continued his stellar play on the inward nine and carded a 35 to finish the round with a 69. Frauenberger shaved two shots from his first nine total of 37 and also shot a 35 to finish with a 72. Boyd dropped four strokes on the back nine as he finished with a 37 for a round of 78. Chipman went up three strokes but still kept pace with a 77 while Ackley shot a 128. F rauenberger’s two day total of 139 earned him the gold medal as the low scoring individual while Cheatham’s total of 148 put him in fifth pace, just two shots away from the bronze. Saylem Maddox from Memphis finished in second with a total of 145. Wyatt Koricanek of Yorktown was third with a 147 and Carson Grawunder from Vega was fourth with a score of 147. Chipman finished with a two day total of 156 which was good enough for a 14th place tie with three others. Boyd finished with a total of 157 and sole possession of 18th place while Ackley carded a two total of 255. Also in action – at the Class 1A level – was Kennard Tiger Garrett Hoy who finished with rounds of 85 and 83 for a total of 168 which placed him 10th in the 1A tournament. 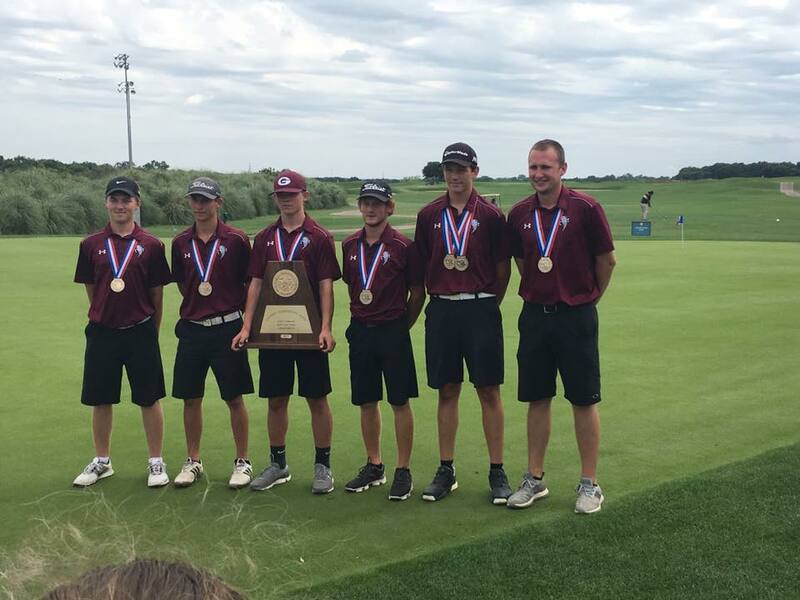 From all of us at The Messenger, congratulations to the Grapeland Sandies on their state golf championship and to Rick Frauenberger on his individual title! SPND! !